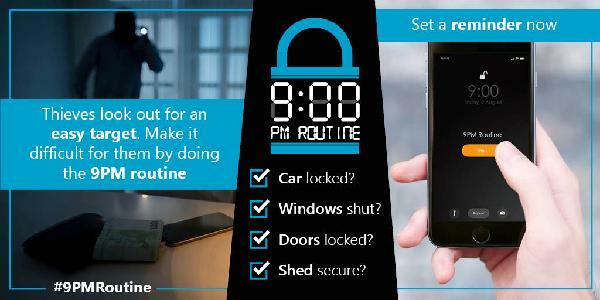 The Denville Police Department has joined other police departments throughout the country in reminding residents to remove valuables from their cars and to lock their cars and homes each night through to social media #9pmroutine. The concept is to get residents to set an alarm or reminder on their smart phone or other device that will alert them each night to make sure that their vehicles and homes are secure. In Denville Township, surrounding communities, and across the country, we are finding that the victims of many car burglaries have left their vehicles unlocked. Those responsible for these crimes go through a neighborhood or business district checking for unsecured doors. When they find an unlocked car, they will go through its contents looking for loose change, credit cards, electronics and other valuables. In addition, if the actors find your car keys/key fob, it is very likely that the vehicle will be stolen. The best course of action to avoid becoming a victim is to make sure that any valuables are removed from the vehicle or at least out of sight, that the vehicle is locked whenever it is left unattended - even in your driveway, and to never leave the vehicle's keys inside the car when it is unoccupied. As a reminder to residents keep their valuables safe and secure, the Denville Police Department will be sending out #9pmroutine reminders via social media. Please take the steps to help protect yourself - set a reminder for 9pm each night to check to make sure your vehicles and home are locked and secure!